Leadership is all about unlocking the potential in others. My faith has sustained me through some very bad times. I've battled cancer, I've lost a child, I've been tested. But whether it's a person of Christian faith or Jewish faith or Muslim faith or other faiths, I think faith gives us humility, and empathy and optimism, and I think those are important things. We have to compete for jobs as a nation. Our competitiveness as a nation is not inevitable. It will not just happen. When people get to know me, they tend to support me. That's what you see in the polls. 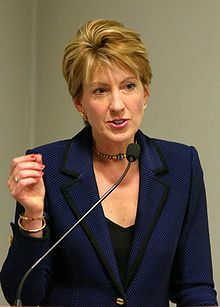 Cara Carleton "Carly" Fiorina (born Cara Carleton Sneed on 6 September 1954) is a former CEO of Hewlett-Packard. I have to say that after chemotherapy, Barbara Boxer just isn't that scary anymore. Upon announcing her senate candidacy. Speech on Leadership at University of Maryland (10 October 2003), broadcast by C-Span. HP’s goal is to bring the most compelling entertainment content and experiences to our customers, … We explored a range of alternatives to deliver a great digital music experience and concluded Apple’s iPod music player and iTunes music service were the best by far. By partnering with Apple, we have the opportunity to add value by integrating the world’s best digital music offering into HP’s larger digital entertainment system strategy. From Joint Apple / HP press release dated 1 January 2004 available here. There is no job that is America's God-given right anymore. We have to compete for jobs as a nation. Our competitiveness as a nation is not inevitable. It will not just happen. They're not terribly imaginative. They're not entrepreneurial. They don't innovate. That's why they're stealing our intellectual property. As quoted in "Carly Fiorina Calls The Chinese Unimaginative Idea Thieves", by Lydia O'Connor, The Huffington Post (25 May 2015). Donald Trump is Hillary Clinton’s Christmas gift wrapped up under a tree. I am the lump of coal in her stocking. Childhood is precious... Hardest part of growing up? Is growing up, I think. David Webb Show (5 August 2015). I have to stand up for myself... I learned something that I could and should stand up for myself, and he learned something, which was she will stand up for herself. If you’ve had to overcome an obstacle or insecurity or fear... genuinely you can bet on that person because they have gathered themselves and found through their inner strength, they have determination, they have grit. Everyone truly does have God given gifts... Find them and use them, and don't let anyone else tell you that you are less than who you are. When I think of something that really is me, that I'm proud of, is honestly, I would have to say, I've never sold my soul along the way... All those things, you're selling your soul, and I don't think I have. The Tonight Show Featuring Jimmy Fallon (21 September 2015). When people get to know me, they tend to support me... That's what you see in the polls. Trump says a lot of things that are crazy... Trump's a moron. As quoted in "Carly Fiorina Repeats After Girl: 'Donald Trump's a Moron'" (16 January 2016), by Ben Gittleson, ABC News. Jim Dicke, David Webb Show (5 August 2015).